Starting life as a series of Lord Of The Rings-type mythical novels, The Chronicles Of Prydain by Lloyd Alexander, the source material must have at first seemed like fine pickings for a then new-age Disney feature. Walt’s “Nine Old Men” had laid their animators’ pencils down for good, with only Eric Larson staying on in a supervisory capacity. On and off the boil for over 10 years, The Black Cauldron finally began to take shape in the late 1970s. It was a casualty of many different factors: an unwieldy book difficult to translate adequately to film, the walkout by Don Bluth and a number of other animators which slowed production down, and the takeover attempt of the Disney Studios in 1984. The company fought back, securing the services and installing Michael Eisner and Jeffrey Katzenberg to run the rejuvenated Studio. Katzenberg and Walt’s nephew Roy E Disney looked at what footage had been assembled and completed on The Black Cauldron project and were shocked. Despite having many exceptional animation special effects including some simply amazing light and shadow work, the film was basically a mess! Katzenberg resorted to doing what no other studio executive had ever done with an animated film. He began to re-edit it! Animated films, by the very process of making them, are produced “back to front”. After a script or outline treatment has been written, storyboards are cut together to aid the visual telling of the film and to develop pacing and story structuring. It’s rare, for example on an animation DVD’s deleted scenes section, to find fully completed and finalised footage which has been cut at such a late stage from the film that it was fully colored. During the production process, these sequences are trimmed, looked at, and worked out differently, most often long before principal animation begins. Sometimes of course, it’s not until the entire film is finished that a small sequence may be switched or deleted (Pocahontas, The Emperor’s New Groove and Atlantis: The Lost Empire all had scenes changed last minute). But here was Katzenberg, actually going in with the scissors and cutting the film as if it was a live-action picture – losing a rumoured 12 minutes-plus of completed finalised ink-and-painted animation! Even with these cuts, The Black Cauldron still feels very episodic and can be a drag to get through. On the other hand, it is a visual spectacular…and a daring leap in tone for Disney to have attempted at that time. Over the years, when Disney has made mention of this film (the 25th in Disney’s legacy), it’s always the secondary “cute” sidekick characters that get promoted over the film’s nominal hero, Taran, and his on-off companion, Princess Eilonwy. Gurgi, a small animal seemingly made of fluff (and somewhat resembling Gepetto from Pinocchio) was the character pushed most in the promotion for The Black Cauldron, and it’s interesting to see how the Studio continues to try and pitch the film to viewers as a warm-and-cuddly fantasy. It was re-issued (albeit very briefly) as Taran And The Magic Cauldron, and would have probably made more money if they’d stuck to the original moniker and let people discover it out of curiosity! When it was suddenly announced for release on VHS, animation fans were over the moon at finally being able to own this long derided feature again, and in some cases see it for the first time. Disney had apparently “run out” of first-run features to release on home video and was seen to be scraping the barrel with this release. The marketing department went into full swing and the sleeve featured Taran, the Princess Eilonwy, Gurgi and Henwyn, all in the magical purple glow of the friendly Cauldron – ahhh! The international sleeve reflected the more ominous tone and nature of the movie itself, with its dark blues and deep black Cauldron. Still, Taran was flanked by Gurgi and the gang, and none of the sleeves lived up to the dark and decidedly non-traditional PG-rated film inside. 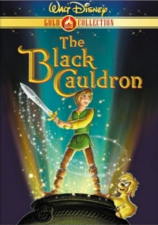 With the demise of LaserDisc, and still no release on that format, the question was now “will we ever see The Black Cauldron on DVD?” – and the surprising answer came a few weeks after Disney launched their Gold Collection string of titles. Not only was The Black Cauldron announced and subsequently actually released, but in Dolby 5.1 and its original widescreen ratio to boot! To put it mildly, animation fans grabbed copies from the shelves – we had our holy grail! But how does it stand up to today’s standards? For me personally, surprisingly well. There are certain scenes of tired draughtsmanship where the animation looks laboured and directionless. Other scenes show up the over-ambitious nature of the project itself. However, when it works, it works well, and despite its shortcomings, The Black Cauldron plays well to the animation and sci-fi fan, even if they may be bemused by the plot and scoff at its antiquity. In the voice cast, there’s not much to get excited about. The leads do their job admirably, but they are sometimes lumbered with the most unconvincing dialog, and in particular, Grant Bardsley’s Taran comes off worst. Otherwise Nigel Hawthorne makes his first appearance in a Disney feature (he would go on to voice Jane’s father in 1999’s Tarzan), and Watership Down’s Hazel, John Hurt, is sometimes impressive as the Horned King. The characters themselves are a mixture of old and new, with the Horned King’s aid Creeper particularly memorable (the inspiration for Hercules’ Pain and Panic? ), but otherwise, pretty standard designs for this type of fare. The animation was the first time the new breed could really show off, and amongst the talents are future lead and directing animators Andreas Deja, Phil Nibblelink, Mark Henn, Barry Cook, and Mark Dindal. Not credited, but involved in production was a young Tim Burton, who was also directing his first short, Vincent, at the Studio and was about to unleash Frankenweenie. Way down the Black Cauldron crew list is “production manager” Don Hahn – now one of the most powerful producers at Disney (and a very nice guy, too) and inbetween effects artists Rob Minkoff and Gary Trousdale! Although the film contains darker tones, it’s not too hard to see some influences, design similarities and even character makeovers find their way in to the television series Adventures Of The Gummi Bears, which debuted just a year later and took a lighter approach to the same type of material, adding greater elements of adventure and comedy. In 1985, I was in the right place, at the right age and at the right time to submerge myself in the epic mythical special effects blockbusters of the early 80s. And from all those films that looked great at the time (I’m talking the likes of Clash Of The Titans, Krull, The Dark Crystal and The NeverEnding Story, etc) I now find myself agreeing with the critics of the time: these films were too adult for children and too juvenile for adults. The Black Cauldron, however, remains apart from that pack for me, perhaps as it has not been as easily accessible and seen as often. Taking its not always successful experiments on the chin, it actually gets better with each viewing. Perhaps someday Disney will return to this title and give us an all-encompassing special edition, featuring this final cut, a documentary on the film’s making and re-editing, and an original in-progress work-print, showing what was cut and how the story was re-arranged. But that’s wishing on a star time again and, for now at least, we must make do with having the film on disc at all, and with a few fascinating bonus features. First up is the Quest For The Black Cauldron game, a usual Disney trivia trip through the lands of The Black Cauldron. Most interesting about this feature is the inclusion of some brief clips from the film presented full-frame and offering the chance to see how the film would look had it been pan-and-scanned. Ugh! Another inclusion is the 1952 Donald Duck short Trick Or Treat, a comical escapade in which Donald must outwit his three nephews on Halloween night. Unknown to him, Huey, Dewey and Louie have enlisted the help of a bona-fide Witch! It’s a fun short, featuring great gags, a catchy theme tune and a seemingly higher budget than some of the other shorts produced around this time. Surprisingly for a Disney release, an original theatrical trailer for the main feature has also been included (although not marked on the packaging), presented full-frame from a very scratchy print. Best of all, and the most interesting extra is the addition of a pretty extensive still-frame gallery. Split into seven separate sections, covering Visual Development, Character Design, Behind The Scenes, Voice Talent, Layouts and Backgrounds, Promotion and Tokyo Disneyland (the film’s attraction in Japan), the gallery features over 100 stills of concept art and production photos. A look at different poster campaigns (including the “Magic Cauldron“ re-issue) is included and provides a welcome chance to see alternatives to how the film could have turned out. Additionally, although these can’t be classed as real extras, there are sneak peeks of the then-coming soon to DVD titles Toy Story 2, Fantasia 2000 and the direct-to-video Buzz Lightyear and Scamp’s Adventure. As far as any DVD-ROM action goes, it seems the all-powerful Cauldron has sucked the very added-interaction life from this DVD – there are no PC-only extras to be found. Disc art has been more exciting in other territories, but the image here seems to indicate that Disney are still not sure how to adequately market the movie. A typical white Disney case keeps the disc safe while a two-sided insert lists the chapter stops and outlines the added game and gallery features. Rather confusingly, the sleeve’s back jacket notes “this film has been modified from its original version and has been formatted to fit your TV”. Well, be assured that whatever plans the Studio once had to only offer Cauldron in a pan-and-scan transfer have gone the way of the Horned King’s army – this edition does reproduce the originally intended and correct widescreen theatrical ratio. Well, let’s be honest – the Mouse was never going to spend a good few thousand dollars making this look brand spanking new. In fact, the print itself is not too bad, and certainly comparable to anything else from around this era. The best thing about the presentation is that original 2.35:1 ratio! This was the first animation film since 1959’s Sleeping Beauty to use a full 70mm frame and one of The Black Cauldron’s unique saving graces. The backgrounds are among some of the finest detailed in Disney animation and mark a change from the purposely stylised (but sometimes bland) layouts of the 60s and 70s. The widescreen framing lets all these magnificent paintings be seen again, and the transfer to video is about as good as it’s going to get. I didn’t go in expecting a pristine, digitally restored image and came away more than a little surprised. Even though it’s not an anamorphic transfer, I’m just glad that The Black Cauldron made it on to disc at all! For years, fans have waited to hear Elmer Bernstein’s score pumping out of all 5.1 channels of their speaker system set up. This Black Cauldron disc’s audio makes up for what may be lacking in the picture department. Audio packs a punch, and the mix seems to have been taken from the original 70mm six-track masters. It doesn’t come across as a reference standard track nor is it as aggressive as today’s mixes, with the audio ranging in dynamics from the strong (the flying dragon attack) to the soft and wispy (most of the quiet dialog only moments). French and Spanish viewers get good dubbed versions in Dolby 2.0 Stereo Surround. As mentioned a couple of times, we really should just be pleased that this movie has made it into the open uncut and un-cropped in this time of Disney Political Correctness. Although sometimes incoherent and episodic, The Black Cauldron is an important animation film in general. It showed what the new generation of Disney artists wanted to attempt, and the then-limits of their ambitions. It pushed the boundaries of animation, with scenes displaying depth and perspective and contains the first uses of computer assisted animation in a Disney animated film in the dragon attack scenes. Although Disney took a risk in allowing the film to run with its dark themes, it’s not (as commonly believed) the first Disney picture to be rated with a PG certificate. That honor went to the 1933 black-and-white Mickey Mouse short The Mad Scientist, a truly creepy affair that would have been a nice companion piece here. It was the first animated Disney feature to pick up the PG rating, and maybe that’s what kept family audiences away. Disney certainly heard the message – the following year would see a much lighter and successful addition to the Disney library, The Great Mouse Detective, which returned the Studio to its roots and itself was born out of Cauldron’s tangled production. And not only would mouse ’tec Basil find himself up against a twisted Professor Ratigan, but there was another mouse on the block: Spielberg and Bluth’s Fievel, star of their competing An American Tail. The stakes in animation were about to get much higher and Disney could no longer afford big-budget mis-fires like Cauldron.